We are pleased to provide the terrific Pam Fastening collated auto-feed screw tools, fasteners and accessories. Pam Fastening auto-feed screw gun tools and collated screw fasteners are designed for high volume, heavy-duty & professional use. We stock Pam stand-up tools and collated fasteners for Tile Roofing, Decking, Docks, Steel Framing, Drywall, Crating, Sub-floor, Trailer Manufacturing and general construction applications. And our discount prices are terrific. Questions ? We love to help. 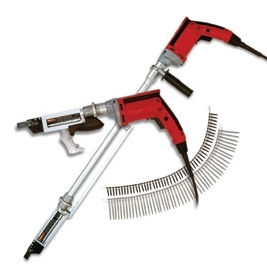 SX2K, Pneumatic Short Gun, for 1-2" screws. PAM SPECIAL ORDERS: We are pleased to special order items or drop ship large quantities direct to you job site.